CoQ10 (Coenzyme Q10) is a vitamin-like nutrient that plays an essential role in the production of energy in the body and in particular the heart, helping to maintain a healthy cardiovascular system, in particular heart muscle function.. As the heart is one of the most active tissues in the body, and requires an adequate supply of CoQ10. It is also important for the health of virtually all human tissues and organs. The body's ability to synthesise CoQ10 declines with age and with taking certain medications. 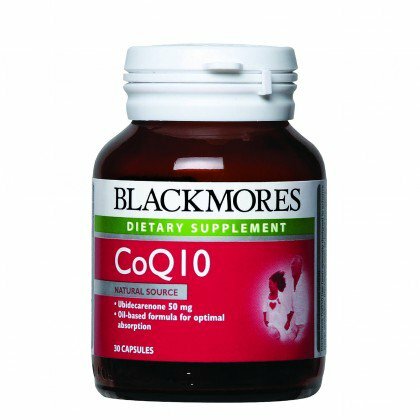 To ensure that you have enough of this essential nutrient, it may be beneficial to increase intake of foods rich in CoQ10, or to take a CoQ10 supplement. CoQ10 also has strong anti-oxidant properties which can also be beneficial for skin health. - Adults - Take 1 to 2 capsules a day with meals. Consult your healthcare professional before use if being treated for diabetes. CoQ10 may increase the glucose-lowering effect of your medication.